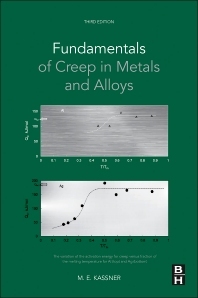 Although the present edition of Fundamentals of Creep in Metals and Alloys remains broadly up to date for metals, there are a range of improvements and updates that are either desirable, or required, in order to ensure that the book continues to meet the needs of researchers and scholars in the general area of creep plasticity. Besides updating the areas currently covered in the second edition with recent advances, the third edition will broaden its scope beyond metals and alloys to include ceramics, covalent solids, minerals and polymers, thus addressing the fundamentals of creep in all basic classes of materials. Researchers and practitioners including metallurgists, ceramists, industrial designers, aerospace R&D personnel, and structural engineers from a wide range of fields and industry sectors. Dr. Kassner is a professor in the department of Aerospace and Mechanical Engineering at the University of Southern California in Los Angeles. He holds M.S.and Ph.D. degrees in Materials Science and Engineering from Stanford University, has published two books and more than 200 articles and book chapters in the areas of metal plasticity theory, creep, fracture, phase diagrams, fatigue, and semi-solid forming, and currently serves on the editorial board of Elsevier’s International Journal of Plasticity.